Over the years Ferry Corsten has released a steady stream of new music, which is set to continue as he recently announced a fresh new series which aims to showcase his artistic skill and range as a producer. 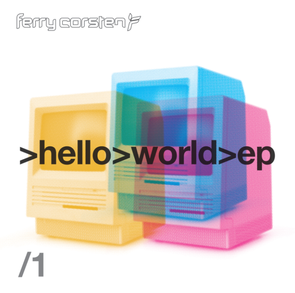 The ‘Hello World EP’ is the first output in a series of three. Consisting of seven unique tracks, they span elements of genres from electro to progressive, trance, tech, house and beyond. The first single off the EP is the electro-pop track ‘Hyper Love’ which was released in 2014. It’s followed by ‘Back To Paradise’, a progressive track with vocals by Haris and by ‘Beat As One’ featuring vocal talent Angelika Vee, in which hypnotic chords are studded with hooky harmonies. A dark and minimal melody leads ‘Tonka’, whereas synths snake you through the single ‘Make It Ours’, which features Chris Jones. High-energy Flashover Mixes of ‘Back To Paradise’ and ‘Make It Ours’ conclude the EP. Check the video out below for a taster, the EP was released last week.